Home / Celebrity / News / Viral / Watch How Joshua Garcia Proposes To Julia Barretto! Watch How Joshua Garcia Proposes To Julia Barretto! Our dear Joshua Garcia is unstoppable on giving surprises to his love and loveteam on cam, Julia Baretto. Maybe he was also impatient of waiting for that sweet YES of Julia to level up their current relationship. What better way to surprise your love the most romantic way? It is noted that Joshua Garcia also surprised Julia on a romantic candle lit dinner. He was also pranked by Julia during the latter’s radio interview with DJ Cha Cha on MOR, and from there you would witness how sweet they are as a couple. And only the most anticipated YES is the only thing that is lacking to make the relationship going. 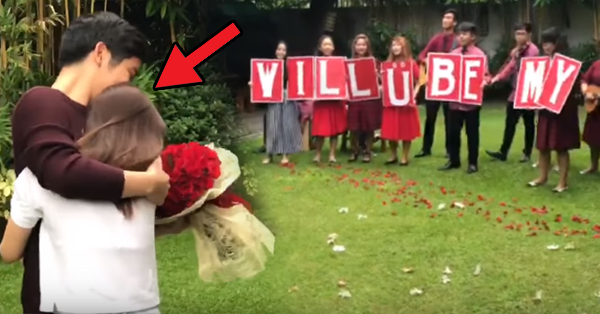 This time, Joshua Garcia though of something different to make her Julia melt with this sweet ensemble singing and holding letter cut outs that read “Will you be my date?” No wonder the face of Julia upon seeing the ensemble and hear them sing brought smile to her pretty face. And when Joshua showed himself with the bouquet of red roses, she was all smile and immediately embraced Joshua with love. They finished listening to the song while their arm around each other, and some witnesses can not help but video the sweet and memorable scene of the two. When will Julia say her YES for Joshua? What is holding her back? Where it is clear that she is equally fond of Joshua Garcia, and they already have established their own endearments for each other. To watch the whole romantic scene and to listen to the beautiful voice of the ensemble. You can also read: Kiray Celis Transformation After Breaking Up With Boyfriend!